Prime Minister Putin has said it is premature to talk about the 2012 presidential vote, but assured journalists they will like the eventual decision on the presidential runner. 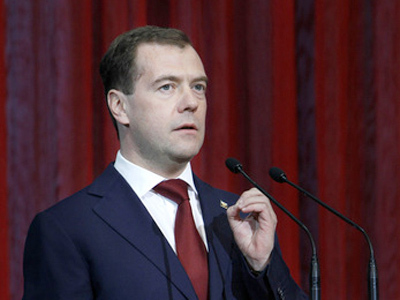 “As for Russia’s presidential campaign, it is really too early to talk about it. The time will come and we will make a respective decision,” he said, speaking at a joint media conference with his Swedish counterpart Fredrik Reinfeldt in Stockholm. 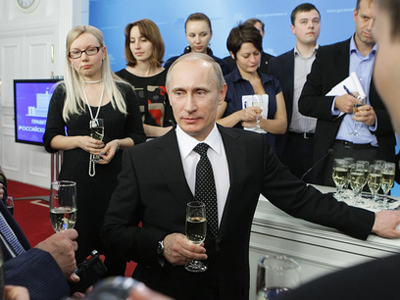 “You will like [the decision], you will be pleased,” Putin added, causing laughter among journalists. 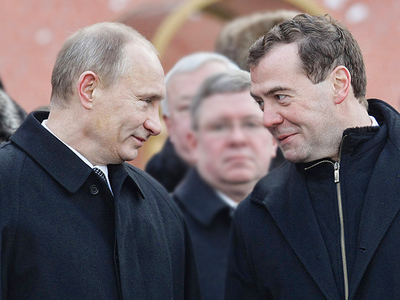 With less than a year remaining before the next presidential election, not a single interview or conference has passed without a question that puzzles many both in Russia and abroad: which of the two in the Medvedev-Putin tandem will be a candidate for the country’s top post? 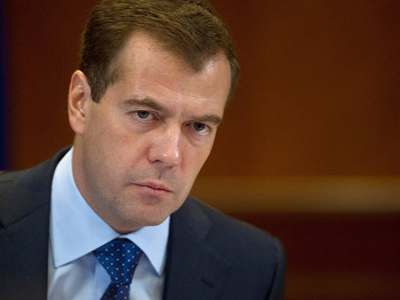 So far, neither President Medvedev, nor Putin have given a clue on the matter, repeating that the decision will be made and announced later. Yet another hot topic that worries many in the world is the situation with Libya, where the bloody stand-off between Colonel Muammar Gaddafi’s regime and opposition continues while Western coalition forces’ involvement seems to be only adding fuel to the fire. A day earlier, speaking at a press conference in Copenhagen, Putin stated that the coalition has no legal right to execute the Libyan leaderas it is against international law. He pointed out that UN Security Council resolution 1973 allowed for enforcing a no-fly zone over the North African state. But the coalition forces are “bombing palaces” every night. On Wednesday, answering Swedish journalists’ questions, the Russian premier observed that there is a contradiction between the care for human rights proclaimed in the world and the ease of making decisions on use of force in one or another state. “Don’t you see that there are serious contradictions between words and practice in international relations?” he said. “Everything should be done to remove this misbalance”. One of the questions referred to NATO’s eastward expansion. 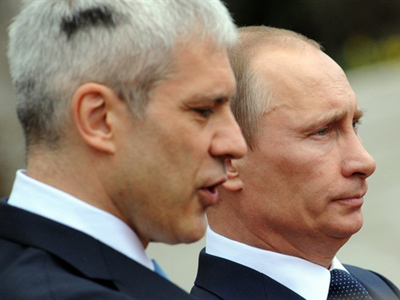 Putin said that the alliance’s enlargement causes concern in Moscow. He observed that NATO is a military-political bloc, a defense structure and "any country must react accordingly, seeing a military infrastructure approaching its borders," cites Interfax. As for Sweden’s participation in the military mission in Libya, Putin said that it is “a sovereign choice of a state”. On Wednesday, Putin, along with the Russian delegation, continued his two-day Scandinavian trip and arrived in Stockholm to hold talks with Reinfeldt, local businessmen and, also be received by King Carl XVI Gustav of Sweden. 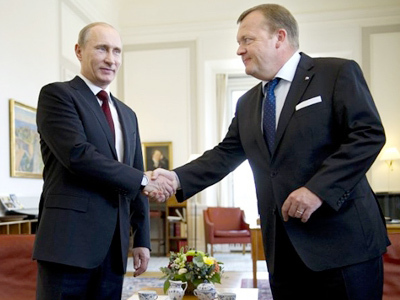 The development of trade and economic ties between Russia and Sweden were at the core of the talks. 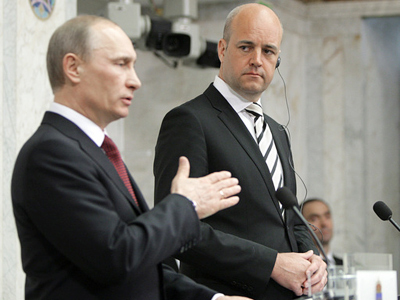 Speaking at the media conference, both Putin and Reinfeldt said they were pleased with the results of the meeting and expressed hope that cooperation between the two countries will continue to develop and deepen. The sides have signed several agreements, including a declaration on partnership in cooperation in such areas as environment, innovation, energy efficiency and space.